The key economic catalysts for yesterday's dramatic spike in Treasury yields was the two-punch combo of surprisingly strong September ADP payrolls which came in at 230K (184K expected), and a blowout ISM non-manufacturing report, which printed at 61.6 (58.0 expected) - the highest reading since August 1997 - but it was the employment component which was the highlight of the report, and stunned traders: at 62.4, it printed at the highest level on record. Between the blockbuster ADP and ISM reports, and together with Fed Chair Powell's surprisingly hawkish speech after hours, it is hardly a surprise that yields moved up as much as they did: after all, if accurate these numbers suggest that the US economy is now well into "overheating" territory. 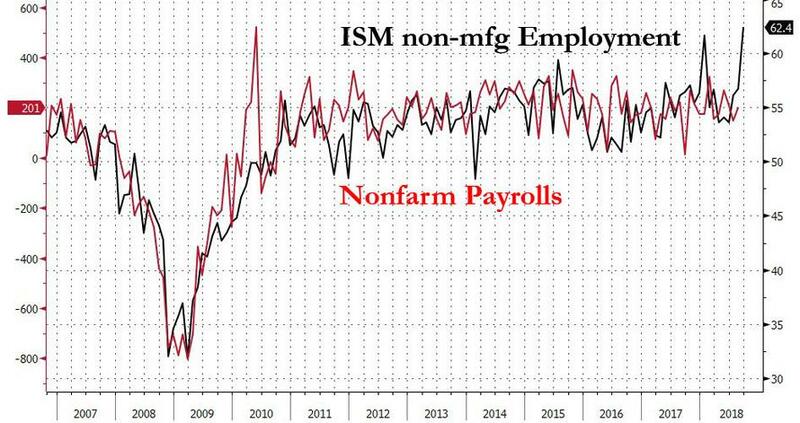 This morning, SocGen's FX strategist Kit Juckes tried to put some numbers to this qualification, and in highlighting the ISM employment print, writes that "there's a strong positive correlation between changes in private sector payrolls and the ISM non-manufacturing employment sub index, though the monthly miss can still be huge too." Putting the two series side by side, Juckes observes that "yesterday's record 62.4 reading for the ISM employment component would ‘imply' a 500k increase in private sector jobs, which would be the best since 1983." I don't think we're supposed to rush out and revise our forecasts for tomorrow's data as a result, but the market will be braced for a strong outcome despite the potential drag from Hurricane Florence, and the underlying message is that the US economy isn't just in fine fettle, it's on fire. That has been enough to take 10year Note yields out of their recent range and to levels (2.23% and still rising) that we haven't seen since 2011. Ed Chairman Powell acknowledges that the funds rate is likely to get above ‘neutral' (i.e., above 3%) at some point, albeit slowly. And with emerging markets cracking again as the dollar surges and yields soar sending EM currencies plunging, the cost of gasoline soaring and capital flowing out at an accelerating pace, tomorrow's jobs report may just be one of the most important, if not for the US economy - which is still basking in the soft glow of Trump's $1.5 trillion fiscal stimulus - then for the rest of the world, where any print even remotely close to 500,000 will unleash a new market tantrum and economic turmoil.